A NEI beer coaster distributed at an international meeting on global warming in approximately 2002. 2.4 Spinning nuclear as "emission-free"
6 Brother, can you spare $18 per megawatt hour? The Nuclear Energy Institute (NEI) is described by Dr Helen Caldicott - a pediatrician and long-standing nuclear critic - as "the propaganda wing and trade group for the American nuclear industry [which] spends millions of dollars annually to engineer public opinion". NEI’s objective is to ensure the formation of policies that promote the "beneficial uses" of nuclear energy in the United States and around the world. It has over 280 corporate members in 15 countries, including companies that operate nuclear power plants, as well as design and engineering firms, fuel suppliers and service companies, and labor unions. In recent years, the NEI has used a variety of approaches to try and win the PR battle to secure a new generation of nuclear power plants. As part of its major PR campaign, the NEI referred to President Bush's State of the Union speech in which Bush had spoken of the need to break America's "addiction to oil". Skip Bowman, NEI president, said Bush's backing of nuclear energy is a "positive sign that the U.S. should expand its reliance on this emission-free source of electricity." The campaign had three themes; firstly to show that the widely held belief that the public does not want nuclear power is incorrect; secondly to show that nuclear energy is consistent with environmentalism; and thirdly that nuclear power should be part of a portfolio of sources to wean the US off foreign sources of energy. In September 2006 the NEI ran full page ads calling on Congress to "Fix Yucca Mountain." It was part of NEI's campaign to pressurize Congress to pass legislation that would boost progress in opening up the repository for highly-radioactive nuclear waste that has been blocked by lawsuits for several years. The NEI was hoping that President Bush would fix the problem in his last two years in office. "The president has been a strong friend of nuclear, and we would certainly like to see legislation advance under his administration," Michael Bauser, an NEI associate general counsel said. The Clean and Safe Energy Coalition was described as a front group forged by Hill & Knowlton for the nuclear power industry, by the Columbia Journalism Review (CJR). The Review criticised the Washington Post for simply referring to Moore as an “environmentalist” and a cofounder of Greenpeace — without mentioning that he is funded by the industry. A string of other newspapers followed this, failing to mention that Moore is also a paid spokesman for the nuclear industry. CJR concluded that it is “…maddening that Hill & Knowlton, which has an $8 million account with the nuclear industry, should have such an easy time working the press”. The words "Clean" and "Safe" were chosen as part of the nuclear industry's mult-million dollar campaign to describe itself. The industry continues using these words despite opposition from anti-nuclear groups. In April 2004 The Austin Chronicle  revealed that NEI had hired the Potomac Communications Group  to ghostwrite pro-nuclear op-ed columns to be submitted to local newspapers under the name of local personalities. Other clients of this Washington DC-based public relations firm include: Areva, Bechtel, BWX Technologies, Entergy and Washington Group International. In 2004, NEI had released Vision 2020: Powering Tomorrow with Clean Nuclear Energy - a report calling for the building of 50 new nuclear power plants. It promoted nuclear power as "clean energy" or “the largest source of clean-air, carbon-free energy in North America". The NEI continues to produce adverts with this message today, despite the fact that it directly defies a 1998 ruling by the National Advertising Division (NAD) of the Council of Better Business Bureaus. In their decision, the NAD noted that nuclear energy cannot be considered "environmentally clean" for several reasons. First, the uranium enrichment process relies heavily on electricity generated from coal-burning plants that produce "a significant amount of greenhouse gases." And perhaps most importantly, unlike other forms of energy, nuclear power produces toxic, radioactive waste, for which no safe method of disposal has been approved. In September 2006, the journal Energy Washington reported how "Major defense contractors have begun to align directly with the nuclear power industry, quietly joining the industry's leading trade group, the Nuclear Energy Institute (NEI), in recent days." The article continued: "The move has been significant in terms of attracting what some DOE sources call an ever-widening range of powerful new stakeholders looking to lobby for nuclear power's rebirth. The largest defense contractor, Lockheed Martin, along with Northrop Grumman signed on as members following meetings between NEI president Frank "Skip" Bowman and defense industry CEOs earlier this month"
"Bowman", said the article "believes becoming a leader in nuclear energy is a U.S. national security issue. The country's lack of infrastructure in specialized, often large, nuclear components needed for new or next generation reactors places the military and hence the nation at growing risk." Brother, can you spare $18 per megawatt hour? NEI staff member Marvin Fertel, in testimony before the Senate Energy and Natural Resources Committee's Subcommittee on Energy on March 4, 2004, pushed for continuing and increasing government subsidies for the nuclear industry. These NEI wish list items include extension of the Price-Anderson Act and an $18-per-megawatt-hour tax credit Congress was considering at the time of Fertel's testimony, in the federal energy bill House Resolution 6. Such government subsidies are necessary, according to Fertel, as "an important step toward making investment in the first few new nuclear plants attractive to the private sector." Fertel also advocated for early site permits other ways to streamline the regulatory process for new nuclear power plants: "New nuclear plants will receive a single license for construction and operation -- not the separate proceedings that created unwarranted delay in the period between construction and operation of today's plants. This approach should limit the regulatory risks that impacted the construction and licensing of many of our operating plants... This should avoid the costly delays common to the old way of licensing a nuclear plant." The American Nuclear Society, European Nuclear Society and NEI jointly held their 2003 International Winter Meeting in New York City. The conference commemorated the 50th anniversary of President Dwight D. Eisenhower's "Atoms for Peace" speech at the United Nations, with a "topical meeting" on Atoms for Prosperity: Updating Eisenhower's Global Vision for Nuclear Energy. According to the January 2004 issue of ANS' "Nuclear News, NEI chair and Entergy Corporation president Donald Hintz focused on the importance of communications during his address to the meeting. "Nuclear's opponents are very savvy about public relations, he warned. They organize sophisticated and high-profile campaigns and other various media strategies to voice nuclear's perceived problems. 'They understand the nuclear industry,' he said, 'and their agenda is to eliminate it.'" Hintz also waxed poetic: "'I believe,' said Hintz, 'the coming decades represent not only an opportunity for our industry, but a responsibility to play an even greater role for bringing light where there is darkness, food where there is hunger, prosperity where there is poverty. We in the nuclear industry believe that we are up to the task, in the spirit with which we responded to President Eisenhower's leadership a half-century ago.'" NEI devotes significant resources towards lobbying the U.S. government on nuclear policy, taxation, foreign trade, environmental and other issues of concern to the nuclear industry. The on-line database lobbyists.info lists nine in-house, Washington DC-area NEI employees who lobby government officials and 13 outside firms that lobby on behalf of NEI. (These outside firms include Shirley & Banister Public Affairs, the EOP Group, the Direct Impact Company and the Advocacy Group.) NEI also has a Federal Political Action Committee. According to Nucleonics Week, in 2002 NEI's compensation of its highest-level officers rose 8 percent compared to the previous year, while its expenses increased more than 18 percent. According to the organization's IRS filings: "NEI's total expenses for 2002 were nearly $40.9 million, and its revenues were reported as $35.7 million. It ended the year with a $5 million deficit... NEI President/ CEO Joe Colvin received an $817,607 compensation package." NEI's frequently-used arguments for nuclear power include that nuclear power is relatively cheap (a claim which ignores the federal subsidies given the industry); nuclear power generation does not produce greenhouse gases; and local economies benefit from existing, new and revamped nuclear power plants. ↑ Press release, "Nuclear Energy Industry Congratulates President-Elect Obama, Vice President-Elect Biden," Nuclear Energy Institute, November 5, 2008. ↑ Kevin Bogardus, "Trade groups change leaders on K Street," The Hill, November 14, 2008. ↑ Amanda DeBard, "Nuclear chief says Obama shuns science," The Washington Times, April 23, 2009. ↑ Dr Helen Caldicott, Nuclear Power is not the Answer, The New Press, 2006. ↑ NEI Profile, NEI website. ↑ "Governance and leadership," NEI website, accessed March 2008. ↑ "Alliance for Energy & Economic Growth Calls for Comprehensive National Energy Policy," NEI press release, May 2, 2001. ↑ David Frum, "France Goes Nuclear," NewMajority.com, June 29, 2009. ↑ David Frum, "France's nuclear solution: What if there were a way to get around nuclear energy's big problem - radioactive waste? There is," The Week, July 2, 2009. ↑ Kevin Howell, "Resident named to nuke industry speakers bureau," Salem News (Salem, Ohio), September 6, 2008. ↑ "Mission," Clean Energy America website, accessed February 2009. ↑ "De Silvestro Becomes Second Woman to Win in Atlantic Championship Competition with Victory in Imperial Capital Bank Atlantic Challenge of Long Beach," Champ Car Atlantic News, April 20, 2008. ↑ "Newman Wachs Racing and Energy Nuclear to visit Georgia Tech," Atlantic Racing Series via F1SA Motor Sport News, September 26, 2008. ↑ "NWR Takes Its Show Car on the Road," Atlantic Racing Series via F1SA Motor Sport News, November 15, 2008. ↑ "Nuclear car takes the chequered flag," World Nuclear News, March 27, 2009. ↑ "Atlantic: The Nuclear Energy Institute, Entergy Nuclear And Newman Wachs Racing Launch 2009 Partnership," PaddockTalk.com, April 2, 2009. ↑ Press release, "Clean Technology Tour Participants Create Big Footprint in DC--Results of Tour to be Presented at Clean Technology 2008," Clean Technology and Sustainable Industries Organization via Business Wire, March 12, 2008. ↑ John Fialka, "Nuclear Industry Plans Ad Push for New Plants", Wall Street Journal, February 6, 2006. 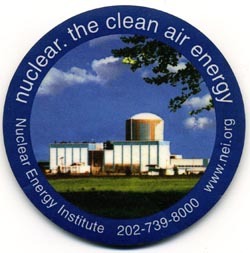 ↑ GRACE Energy Initiative, False Promises: Debunking Nuclear Industry Propaganda, October 2006. ↑ NEI, NEI Exposes Grace Myths with Facts, October 26, 2006. ↑ "False Fronts: Why to Look Behind the Label", Columbia Journalism Review July-August 2006, Editorial. ↑ William M. Adler "Will Shill for Nukes", Austin Chronicle, April 16, 2004. ↑ Potomac Communications Group, Sourcewatch 2005. ↑ 34.0 34.1 Lisa Mascaro, "Nuclear industry to push stopgap waste sites," Las Vegas Sun (Nevada), March 23, 2008. ↑ "Bottom Line," The Hill, June 1, 2009. ↑ "Nuclear trade group spent $1.3M lobbying," Associated Press, March 19, 2008. This page was last edited on 11 October 2017, at 20:37.